The thought occurred to me, what if I made a batch of full-strength wort and used that for all of my brewing liquor? I could make an all-grain wort that was more concentrated than normal, allowing me to brew an all-grain, high-gravity beer without an extended boil. Also, I could do this without adding sugar or malt extract in the kettle. So I thought it through, brewed a few test batches — on my own and with friends — and called the technique reiterated mashing. I knew that mashing twice in one day — once to make the brewing liquor and once for the main batch — would be time-consuming. And, I also knew I’d be using about twice as much grain as on a normal brewday, so I tried to plan everything out carefully, so I wasn’t wasting either time or grain. 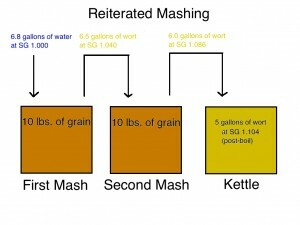 In today’s article, I’ll explain the theory behind reiterated mashing. Tomorrow, I’ll explain the practical elements based on my test batches and also give a recipe. In the first mash, I wanted to make all the brewing liquor I would need for the main batch — both strike water and sparge water. Given that this “water” was going to be wort, I didn’t want to waste any of it by leaving any behind in the grain bed. So I calculated how much wort I’d need to mash the grains in the main batch, then rinse them with wort and run the grain bed dry. This turns out to be a volume equal to the pre-boil batch volume of the main batch plus the amount of liquid that would be absorbed by the grain in the main mash. I also wanted to get as much as could from the grains, so I wanted the first grain bed to be fully-sparged; although I could have collected higher gravity wort by simply adding more grain and not sparging, I want to make a nod towards efficiency. I relied on my brewing notebooks to see how much grain I used and how much wort I collected from it when I did fully sparge my grain beds. For the second mash, I wanted to mash with wort as my brewing liquor and sparge with wort as well. This would let me collect wort at up to twice it’s normal density. I would thus not need an extended boil to yield an all-grain, high-gravity wort. It occurred to me that in this high-density wort, everything would be a higher than normal density — not just the sugars, but the proteins and tannins as well. One way to lower the protein and tannin levels would be use some flaked maize as an adjunct in both mashes. This would also allow me to brew a very light colored beer, that was deceivingly strong, which was something that appealed to me. You can formulate reiterated mash beers a few different ways; it just depends on what your goals are. If you wanted to brew the highest gravity beer possible, you could collect only the first runnings from the first mash. Then, you could collect only the first runnings from the second mash. After all, if you’re trying to collect the highest gravity wort possible, adding sparge water at any stage is counterproductive. Of course, you’d also be leaving a lot of sugars behind in your two grain beds. On the other hand, if efficiency is your goal, you might want to make only as much wort in the first mash as you need for your strike water in the main batch. Then, cou would rinse that grain bed with water (not wort), giving you a better efficiency. This would lower the strength of the wort you collected, however, but your extract efficiency could hypothetically be right around normal for you. For my beer, I opted for a compromise — the first grain bed is fully-sparged, but the main grain bed is only sparged with wort. This does leave some sugars behind in the main mash, buy lets me collect a higher gravity wort. The gravity of the wort you yield will depend in large part on your extract efficiency — the better your efficiency, the more concentrated your wort will be. If you get around 70% extract efficiency, you should be able to collect around 6.0 gallons (23 L) of wort at SG 1.086 from the main mash and boil that down to 5.0 gallons (19 L) at SG 1.104. If you mash for a fermentable wort, and get about 80% attenuation from your fermentation, this will give you a beer around 11% ABV. I’ll give the recipe and tips from my experience using this method tomorrow. The other tradeoff is in time. If you mashed all your grains at once and fully sparged the grain bed, you’d have to boil for a few hours to reach to your target gravity. (And this would yield a darker wort.) In this case, your boil will be shorter, but you’ll spend extra time dealing with the extra mash. This is one of the coolest ideas I’ve come across. I BIAB, so I suppose applying thid to my setup would be fairly straight forward. I’d love to do something like this for a huge Belgian blond, or imperial Saison! I haven’t tried it with BIAB, but I can’t see any reason it wouldn’t basically work. I do wonder if your efficiency would be low enough that it wouldn’t be worth the hassle. You get the best results with this method when you reach fairly high extract efficiencies. It still works at lower efficiencies, but you end up with a moderately strong beer and there are plenty of ways to brew a moderately strong beer that are much easier. 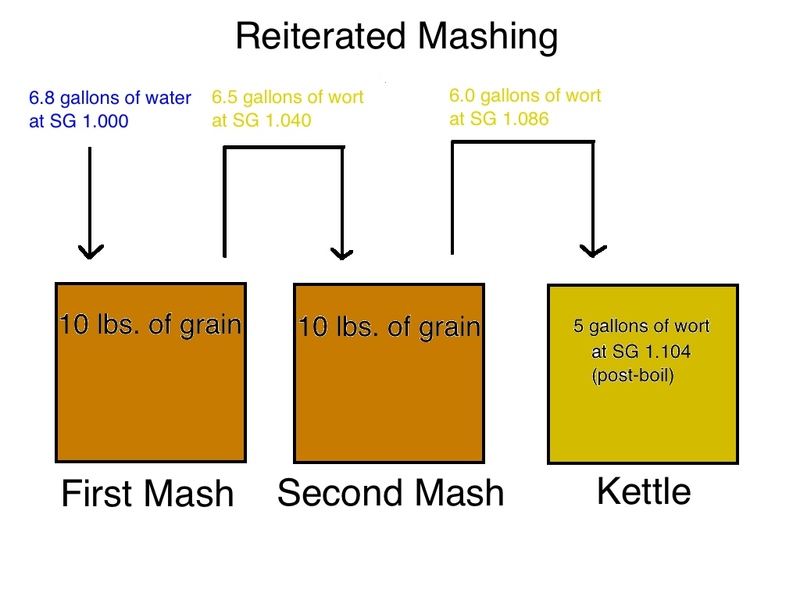 If you wanted to maximize efficiency while still going for the biggest beer possible, is there any reason not to use the first runnings from each mash for one beer, and then go back and sparge each mash for a second, lower gravity beer? Partigyle your reiterated mash, so to speak? Would there be any advantage to sparging the first mash, and then using those runnings to sparge the second? On the other hand, if you blended the second runnings of both mashes, that would take relatively less time. That’s a good idea. Use the first runnings (no sparging) from both mashes for the main beer for a high-gravity wort. But, sparge both mashes to make a smaller beer to not waste sugars. If you had two homebrewing rigs and 3 or 4 homebrewers on brewday, this could be done. Good suggestion. what about adding DME to your Mash water as your heating it up? Save some of the time that you’d use waiting for conversion. Its a interesting mashing idea….